Endoscopic grading of the gastroesophageal flap valve (GEFV) is a useful predictor of gastroesophageal reflux status; abnormal GEFV was associated with reflux esophagitis. Atrophic gastritis is often found in Japanese patients and is inversely related to reflux esophagitis. 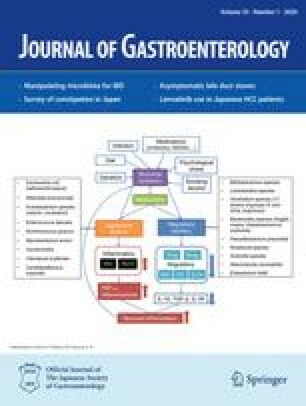 The aim of this study was to examine the association between GEFV, reflux esophagitis, Barrett's epithelium, and atrophic gastritis in Japanese patients by prospective endoscopic assessment. Methods. We enrolled 548 Japanese patients (296 men and 252 women; mean age, 57.3 years). GEFV was assessed by the classification of Hill and colleagues, reflux esophagitis was assessed by the Los Angeles classification, and the degree of atrophic gastritis was scored as: none, mild, moderate, or severe. Barrett's epithelium was recognized by the endoscopic detection of an upward shift in the columnar lining. Results. Reflux esophagitis and Barrett's epithelium were found in 42 (7.7%) and 67 (12.2%) patients, respectively. An increased prevalence of reflux esophagitis and Barrett's epithelium was correlated with an increased grade of GEFV. Abnormal GEFV (grades III and IV) was a risk for reflux esophagitis (adjusted odds ratio [OR]), 13.33 (95% confidence interval [CI], 6.08–29.25) and Barrett's epithelium (OR, 3.55 [95% CI, 2.04–6.20]), while the presence of atrophic gastritis was inversely associated with reflux esophagitis (OR, 0.15 [95% CI, 0.07–0.36]), but it was not associated with the prevalence of Barrett's epithelium (OR, 1.16 [95% CI, 0.67–2.01]). The prevalence of Barrett's epithelium and the severity of atrophic gastritis increased with age, while that of reflux esophagitis and abnormal GEFV did not change. Conclusions. Reflux esophagitis and Barrett's epithelium are associated with abnormal GEFV in Japanese patients. The presence of atrophic gastritis is inversely related to reflux esophagitis, but it is not related to Barrett's epithelium in Japanese patients.